325 (15 Feb 45), 317, 218, 322, 324, 325, 326, 328, 329, 330, 331, 335, 336, 339, 342, 344, 348, 350, 351, 354, 355, 359, 363 (20 April 1945). For Mission dates, targets and Mission Reports, see Combat Missions. 2Lt Joseph V. Leach (P) - Missions 355 and 359 flown as a Lead Crew CoPilot and CoPilot 2Lt Olson flying as First Pilot with the Enlisted members of the crew in another B-17. The other 2Lt Leach missions were flown as a First Pilot. Completed 23 combat missions on 20 April 1945 (Mission 363). 2Lt John L. Olson (CP) - Flew on 17 missions with 2Lt Leach (317, 318, 324, 325, 326, 328, 329, 330, 331, 335, 336, 339, 348, 350, 351, 354, 363), Two missions as a First Pilot 355 & 359) and two mission as CoPilot with other Pilots (315 & 340) plus one mission as a Lead Crew CoPilot with Group Commanding Officer LtCol William C. Sipes (364) Completed twenty-two combat missions on 25 April 1945 (Last 303rd BG(H) mission) (Mission 364). 2Lt Earl E. Triebes (N) - Flew on 4 missions with 2Lt Leach (315, 317, 318, 322) and one mission with another Pilot (331). Became a Lead Crew Navigator: Flew two missions with a Deputy Lead Crew (338, 342) and eight missions with a Lead Crew (324, 328, 344, 348, 352, 354, 351, 358). Completed 15 combat missions on 11 April 1945 (Mission 358). S/Sgt John W. Psota (Tog) - Flew on 15 missions with 2Lt Leach: (As Togglier - 315, 317, 318, 322, 324, 325, 326, 328, 329, 330, 336, 339, 342, 363 and as Tail Gunner - 354). Two missions with 2Lt Olson after he was upgraded to Pilot (355, 359) and one mission with another Pilot (358). Completed 18 missions on 20 April 1945 (Mission 363). Sgt James H. Bridgeman (E) - Flew on 20 missions with 2Lt Leach (All of 2Lt Leach missions except for 355, 359 & 363) and two missions with 2Lt Olson after he was upgraded from Crew CoPilot to First Pilot (355, 359). Completed 22 combat missions on 14 April 1945 (mission 359). Sgt Robert R. Wilburn (R) - Flew on 20 missions with 2Lt Leach (All of 2Lt Leach missions except for 355, 359 & 363), Two missions with 2Lt Olson after he was upgraded from Crew CoPilot to Pilot (355, 359) and one mission with another Pilot (358). Completed 23 combat missions on 14 April 1945 (Mission 359). Sgt Junior W. Anderson (BTG) - Flew on 21 missions with 2Lt Leach (All of 2Lt Leach missions except for 355 & 359 - Mission 363 flown as Waist Gunner. Two missions with 2Lt Olson after he was upgraded from crew CoPilot to Pilot (355 & 359). Completed 23 combat missions on 20 April 1945 (Mission 363). Sgt Thomas M. Roberts (WG) - Flew on 7 missions with 2Lt Leach (As Waist Gunner 315, 317, 319, 325, 329, 330 and as Tail Gunner (348). Other 2Lt Leach missions (315 through 355) flown with no Waist Gunner and missions 359 & 363 with substitute Waist Gunners. Flew on four missions as Waist Gunner with other Pilots (316, 327, 328, 342). Completed 11 combat missions on 30 March 1945 (Mission 348). Sgt Oda F. Sulley (TG) - Flew on 19 missions with 2Lt Leach (315, 317, 318, 322, 324, 325, 326, 328, 329, 330, 331, 335, 336, 339, 342, 344, 350, 351, 363) and two missions with 2Lt Olson after he was upgraded from crew CoPilot to Pilot (355, 359). Completed 21 combat missions on 20 April 1945 (Mission 363). 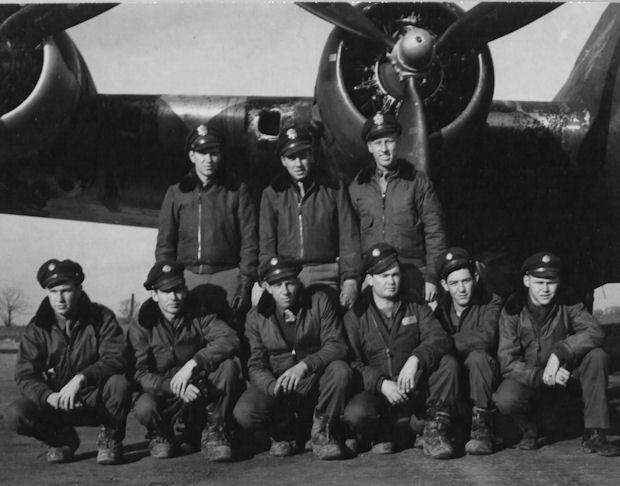 Lt Leach and his crew flew no combat missions in their above crew photo PFF B-17G 42-97557 Mercy's Madhouse (358th BS) VK-X. Lt Leach never had a regularly assigned B-17 and flew his 23 combat missions in 16 different B-17s including 7 named and 9 unnamed. Mission 331 (7 March) in B-17G 42-38050 Thunderbird (359BS) BN-U. We were hit hard (by flak) and fell from 28,000 to 18,00 feet. The number three engine was on fire. 2Lt Triebes, Navigator, left the nose to go up with 2Lt Leach (P) and Olson (CP). I was ordered to stay in the nose and give reports on the fire. I figured that if the prop fell towards the fuselage, I would have my own plane. When the engine burned out, the prop fell and thankfully it went straight down. On another (unnamed mission) - The Red Light would not go out. After dropping my eight 250 pounders, the red light would not go out. The bomb-bay doors would not close, so I unhooked my oxygen mask put on a walk-around bottle and made my way back to the bomb-bay. I discovered that one bomb did not release. Standing on a walk about six inches wide with a great view of the mountains, I held on with one hand and released the bomb with the pliers held in my other hand. I then went back to the nose, got back on oxygen and closed the bomb-bay doors. The red light went out. Those were about my most unusual missions, plus going to Berlin twice (#324 - 26 Feb 45 and #339 - 18 Mar 45) and seeing our share of the German flak.